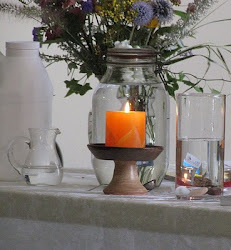 UU A Way Of Life: First Principle Study Group - Class three - What is a "person?" First Principle Study Group - Class three - What is a "person?" Is a person their body? No, their body is constantly changing. Is a person their mind? Decartes is famous for saying “Cogito ego sum,” I think therefore I am, but thoughts change constantly. Is a person their emotions? Again their emotions fluctuate and change all the time. Is a person their personality? No, their personality often changes for various reasons. Are they their social status and the roles they play? No, they also change frequently. So if a person is not the body, the mind, the emotions, the personality, the status and roles, what is the person? The person is the witness. The witness is that part of a person which observes the person’s functioning in all of the domains. Some people have a more highly developed witness than others. In the field of Emotional Intelligence, this is called “self knowledge.” To what extent does a person understand what makes him/her tick? At a spiritual level, a mature soul recognizes that (s)he is part of the interdependent web. The person is a social construction which can only be understood and appreciated in a social context, in relation to other people. In A Course Of Miracles, “Son of God” refers to the plural aggregation of all of humanity. At advanced stages of spiritual development, the ego is dropped and there is a merging with the Ground of Being. 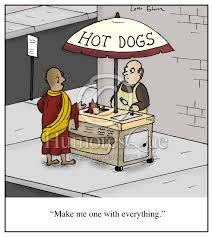 The Buddhist monk, in the joke, asks the hot dog vendor to make him one with everything. The energy which animates our egoistic manifestation is eternal and lives in the Universe eternally. There are many sides to our personality which we are aware of in our different relationships and roles we play. We are one person with our parents, another with our partner, another with our children, another with our co-workers, another with our friends, etc. Who is the real you? Who is the you that rises above these roles and relationships? Describe it as best as you can. 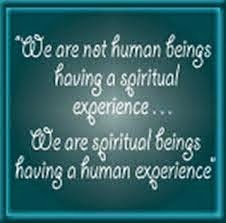 To what extent have you set your ego aside and gone with the flow on the spiritual path? What helps you move into and stay in this space? To what extent have you been able to meditate and achieve a state of “no mind”? To what extent do these ideas matter to you? To what extent is it important to you to rise above the mundane concerns on the path of the ego? To what extent do you desire to find peace and joy which comes from rising above the every day concerns of the material life? This is the third class out of 8 on the first principle of Unitarian Universalism. Class materials are published every Monday.